When I lived in Brooklyn, the shoreline of New York Harbour had huge granite boulders that had been put there to prevent tidal erosion. Whenever I got bored (i.e. most days) I would walk to the harbour and jump from boulder to boulder until I was at the water’s edge. Once, when I was doing this, I imagined slipping and falling between the rocks, and a numb sensation spread through my legs. I have noticed this happen on several occasions and it can sometimes occur when I think of someone else having an experience that would result in serious leg injury. For example, it once occurred when I was in the park and a small child painfully fell off her bike. We know that the brain has several ways of registering pain, and once registered there are different responses to it. The most likely explanation of my numb feeling is that my brain released endorphins; this is an abbreviation of ‘endogenous morphine’, a form of opioid that exists naturally in the brain. It is released in certain situations of extreme exertion or threat and has an analgesic effect: it neutralises the sensation of pain. This is a brain routine kicking-in that has the purpose of managing pain, and the effect is that my legs felt numb. I am not particularly interested in researching long theses on the neuroscience stuff because I am going to follow a completely different line of enquiry. What interests me is that an act of pure imagination can trigger an alteration in my brain state. The alteration in my brain state is supposed to be a reaction to real external events, such as actually breaking my leg or being chased by predators. If a pretended event that exists only in my imagination can cause these changes, then that means that a human brain can do something that a chimpanzee brain almost certainly cannot do. A chimpanzee does not have language and that limits its ability to form concepts. That in turn limits its ability to think in hypotheticals. It would be a fairly conventional view for both philosophers and animal behavioural scientists to suppose that a chimpanzee cannot speculate about a predator that is not actually there or a traumatic leg injury that has not actually happened. However, we all have to admit a certain level of philosophical doubt about this. A human is a self-referencing mechanism. Computer scientists understand that self-referencing is the origin of circular causality. If you write ‘=A1’ in cell A1 of a spreadsheet, then the memory cell self-references. The self-reference prevents the cell from computing any meaningful answer and the spreadsheet would be considered to have a circular argument. In old-skool computer programming language we write sequential lines of code. If at line 42, we tell the programme to go back to line 41, then the programme (rather than the memory cell) self-references. Unless the code at line 41 sends it somewhere else the programme will keep repeating lines 41 and 42 until someone pulls the plug out. Self-referencing is a pre-requisite of circular causality, and I have been focusing on the fact that humans self-reference in a way that has no equivalent in any other system that I can think of: we impersonate our own behaviour. Neither chimpanzees nor computers can do this. My work is mostly about exploring the consequences of this self-reference. When a human does this, it has consequences that could include circular causality. The models of compulsive action that we explored in Section B: Compulsions, all involve feedback loops that never switch off¾an unusual consequence of the corruption of a biological system that is supposed to promote survival. Until we understand all the possible causal pathways that this self-referencing might drive, we will never understand ourselves. If an act of pure imagination – in other words something that occurs in my brain¾can trigger a change in a brain state¾something else within my brain – that is supposed to be a reaction to something in the external world, then this is a self-referencing mechanism of an entirely different nature. What causal pathway could this set off? The one thing that is fairly certain is that these are pathways that are not the product of an animal that is a ‘survival machine’ in the shorthand of evolutionary theorists. It is a pathway that is more appropriate to a ‘machine that is goal-seeking emotional outcomes’, since I have now stumbled upon a way that I can change my emotional states by acts of pure imagination. I speculate that this could lead to hypothetical explanations of rational actions that would be recognised by psychiatrists as being mental disorders. 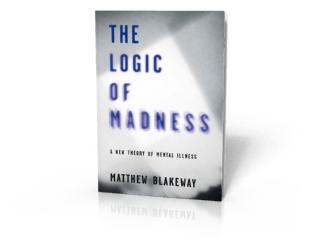 Psychiatry makes distinctions between neurosis, acute personality disorder and psychosis. These distinctions have been recognised since the nineteenth century. The logical structures that we constructed in Section B: Compulsions would fall into the category of neuroses and those in Section C: Impulsions would fall into the category of acute personality disorder¾what I would simply call a rationally derived self-destructive action of a compound nature. A psychosis is something beyond this¾a state where somebody appears to have completely lost touch with reality. A ‘delusion’ means more or less the same thing to a psychiatrist as it means to a layperson: a belief that is wildly different from observed reality. The difference between imagining something and believing it is quite subtle. It is clear that the writer J. R. R. Tolkien did not believe in Middle-earth, although The Lord of the Rings is clearly allegorical since it was inspired by the horrors of Nazism and World War II. It is not entirely clear whether a Hindu believes in Ganapati or that an evangelical Christian really believes every word of the Bible. What I am suggesting is that if an act of imagination can trigger a change in a brain state, then this is a form of self-reference that opens up a world of possibility for emotional gratification. If we assume a human is a totally rational actor that is a machine that goal-seeks emotional outcomes, then how can a human think that he is the Pharaoh Sekhemresewadjtawy Sobekhotep III, or that he is being pursued by hideous monkey demons? Can we construct a hypothetical situation where thinking this is an entirely reasonable thing to do? This person has one biological emotion that drives action and another that inhibits action, and by a compound manipulation of the behaviour, they have found themselves in the situation where the Biological Stimulus for the driving emotion has become the Affectation Stimulus for the inhibiting emotion; so only the behaviour for the inhibiting emotion is displayed. We can consider first the two emotions separately, and then look at the inter-causality that relates to the crossing over. With respect to the inhibiting emotion, our hypothetical individual is affecting the inhibiting emotional behaviour, and so has an incorrect belief that they are identifying the inhibiting emotion in themselves. This simply acts as a constraint on action, because with inhibiting emotions we do not get the inversion of causality that arises with driving emotions. With respect to the driving emotion (in isolation), they suppress the behaviour and are therefore able to recognise that emotion in other people, but remain unaware that they are experiencing it themselves. The biological emotion is supposed to drive an action, but is not doing so in this case. Clearly, this situation is self-destructive in isolation: they think they are experiencing an emotion that inhibits action. Therefore, trying to compute an action that achieves a future emotional goal is irrelevant in this case. To optimise their biological fitness, they should be calculating the action that the driving emotion is supposed to drive. However, they do not acknowledge that they experience it because they do not demonstrate the behaviour. Let us consider the impact of the crossing-over. Driving emotions are feedback mechanisms. They arise because the human (or animal) needs to rectify something, and the stronger the need to rectify, the stronger the emotional urge. A human, at any point in time, will have multiple emotions, and the one that is strongest will tend to become dominant over the others and drive the action that occurs next. If you are both hungry and thirsty, then the stronger emotion will determine whether you drink or eat first. This action cancels out the urge to act. Here, the driving emotion is an Affectation Stimulus for an inhibitor; so the action does not occur and the feedback mechanism is broken. Failure to act on the driving emotion results in it becoming steadily stronger, leading the inhibition to become all-embracing and eventually consume the individual. The inhibition will become this individual’s dominant emotion on an almost permanent basis. The negative feedback mechanism has turned into a positive feedback mechanism, where the urge to not act keeps getting stronger. This is a compulsion to not do something that biology dictates you should do¾what I generically call an ‘Anti-Compulsion’.